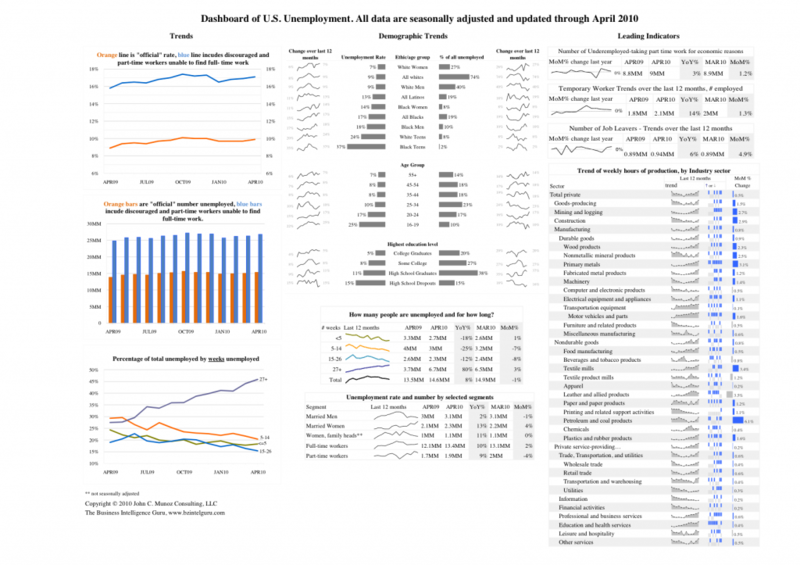 The unemployment insight dashboard is now updated with April’s unemployment figures from the BLS. While the unemployment rate is essentially unchanged, the nasty trend in the long-term unemployment continues. The numbers for April show the long-term unemployed group grew by another 200,000. Now, more than 6.7MM Americans, that’s the equivalent to the entire state of Washington (men, women, and children), have been jobless for more than 6 months. This population now accounts for 46% of all unemployed. Also, if you’re wondering why the unemployment rate increased despite the fact that the number of people who found new jobs increased, a good explainer can be found here, at the WSJ blog. In my update last month I said I’d try to get more insights about the long-term unemployed. It turns out there’s a fair amount of information for this group, but the data are updated annually, not monthly. Nonetheless, in the coming weeks I will generate some supplemental posts analyzing the long-term unemployed from the new found data. Until then, here’s a link to a story about the long-term unemployed in the Huffington Post. I welcome your comments, both positive and negative. I especially want to hear your thoughts on improving this dashboard. In particular, I’m considering getting rid of and/or dramatically altering the bar chart on the left side of the dash showing the number of un/underemployed Americans. I think the scaling of the chart makes differences in the blue bars hard to pick up, I also don’t like the lack of context in the chart. Perhaps indexing it to 1 year ago might be better. If you’d like to print out or save a copy of a beautiful, high-res, 11 x 17 pdf version of this dashboard, just click here. For the bar chart, I would perhaps get rid of it and just add the actual values as a second axis on the line chart above, though you would have to see how the non-zero axis would work for that. The group of most concern is the long-term unemployed – how about some details about them – demographic, industry, geographic. You hit the nail right on the head for the long-term unemployed. The BLS data that I got on that segment breaks it down by demographic and industry. I didn’t see a geo based breakdown. Regardless, those two splits should provide plenty to look at. Will have to give some thought to your point about the logic-based summaries. I haven’t implemented anything like that in Excel, but it would be interesting to try to programatically determine interesting facts to point out on the dashboard.